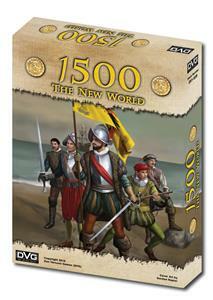 1500 - The New World is a board game for 2 to 6 players! Each game sets-up in 10 minutes and plays in under a hour! The fast flowing game play is perfect for casual and serious gamers ages 12 and up! The game comes with a beautiful map, high quality cards, thick counters, and an easy to use rule booklet! The core game is for 2 to 6 players. With the addition of 1 or more Nation Expansions, it becomes a game for 1 or more players.